Dallying In The Dirt, Issue #288 - When the water fall fails there is some ugly work to do. Last week was an ugly week. There were so many things in the garden that needed doing and that I wanted to do. But! The bottom pond desperately needed cleaning out. The pile of gunk at the bottom was deep and the plants were overgrown and so we spent a couple of wet, dirty and back breaking days. “Well that’s done!” I thought. Turned on the pump and nothing happened. Fiddled, fussed and then cursed and then hauled the large pipe and filter apparatus, that holds the pump, out of the pond. Took the pump apart to find that two of the three blades were broken off of the impeller. Off to the pond store where I found the only bright light in this story. They sell replacement impellers for $25 instead of a new pump for $160. The repaired pump is a bit noisy but seems to work well and you can’t hear the noise once it’s in the pond. Now I can get back to the enjoyable chores in the garden. Oops! Not so fast. Once the pump was running the water in the pond started to disappear at a noticeable speed. That means there is a leak in the river system or waterfall. If you look carefully at the picture, on the right hand side of the waterfall you will notice one large rock and an empty space above it and on the deck a pile of similar rocks. Over the years the weight of all those rocks had sunk the edge of the pond. That means the edge of the rubber liner is now below the water level when the pond fills while the pump is running. 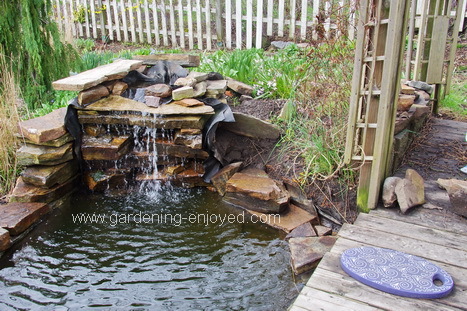 The real answer was to rebuild the entire waterfall; not an idea I embraced enthusiastically. With some effort and a long pry bar, I was actually able to lift the entire side of the waterfall by a few cms and then shim it up there. I will rebuild that portion of the falls when I catch up with some of the other chores. Found another, easy to fix, leak in the next river and now the water seems to stay where it belongs and my body is the only semi functional thing in the yard. I do love to talk about the therapeutic joys of gardening. Maybe next week. 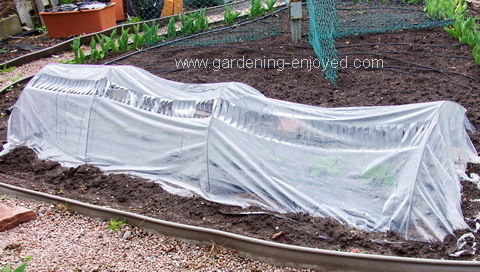 A couple of years ago I bought this poly tunnel at a yard sale. Thought I might actually try using it this year to get an early start on some vegetables. I was a little late getting it set up, see waterfall story above, and it seemed to be a lot of effort to gain a week or so but I have to try these things. I seeded Spinach, Swiss Chard, Beets and Carrots and as of today they have all germinated and are growing nicely. A few of my oriental vegetable transplants were also planted between the two rows of seeds and they seem to be thriving. It’s too early to tell if they will be edible sooner than the ones that are still in the cold frame and might get planted out this week. Can’t plant them until I get the rabbit fence in place or I get the sub-irrigation containers set up and ready to plant. In the middle of last week, spring really arrived, we ate the first eight stalks of Asparagus from the garden. It is always so delicious and can almost make you forget about the several kgs of rocks we had adjusted by the waterfall. It does sound wonderful with the repaired pump. All of the spring flowering bulbs are a delight and more of them are blooming each day. Some last a few years and die out, some, like the Narcissus in the middle of the picture develop lovely long lived clumps. Then there are the spreaders. The blue Chionodoxa covering the berm, fall into that category. I don’t even remember planting any of them there but either I or the squirrels must have done so. 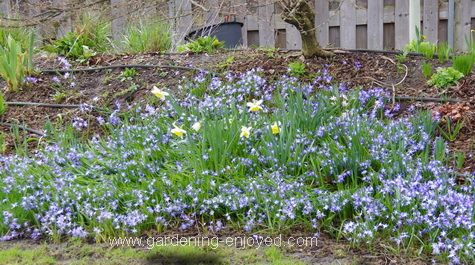 In just a few years they have spread into that carpet of blue that is now lighting up the berm through much of April. They have a pink cousin that is equally aggressive and is filling a few spots around the deck. I used to carefully sort out their bulbs whenever I was planting anything else in that spot but now I just treat them as part of the soil as I dig and backfill planting holes. Nothing slows them down. It would be perfect if they only spread where I want them to but every year they remind me that I’m not actually in control, even though I try to delude myself that I am. Let Mother Nature run amok, I will eventually learn to sit back and enjoy whatever she does. Valerie Asks? I cannot understand how you can have flowers, fruit and vegetables and the squirrels and rabbits do not interfere. I have all my tulips growing with the tops gone I think rabbits had a feast. The squirrels have been putting holes in the ground searching for what I may have planted. I planted potatoes in my clay pots which used to have hostas last year. This year I would like to give my day lilies away and plant potatoes and other vegetables in the ground, what should I do to keep them maturing safely without being dug up and destroyed? Ken Answers! It's a constant battle with squirrels and rabbits. Grow Potatoes they don't seem to like them as they never bother mine. I plant the things they do like in an area of the garden that I keep fenced with some narrow gauge wire fencing. That seems to work as they have many other things to eat that they don't have to work for. Ken Answers! Your Asclepias, Butterfly Weed, might be alright planted out doors now but I would probably pot them up and keep them warm until the soil is warmer outside. They are a very tough perennial but they are very slow to emerge in my garden which would seem to indicate that they like to have warm soil before they wake up. I think it’s more likely the squirrels that behead Tulips. They do the same thing here. Fencing for squirrels is difficult but the repellants such as coyote urine do seem to help. If you plant 10 Tulips and the squirrels eat 5 you are devastated but if you plant 100 Tulips and the squirrels eat 5, who cares.